Eating one egg a day may lower the risk of type 2 diabetes, a new study finds. The findings from a university in Finland add fuel to the fiery, perpetual debate: are eggs good or bad for diabetes? Studies have swung both ways – but this controversial report says that, when it comes to risk-prevention, eggs are a good thing. Testing men, they found that those who ate a daily egg had a certain lipid profile in their blood which is common among men who never develop the disease. Diet is crucial for people with both type 1 and type 2 diabetes. People with type 1 cannot produce insulin, which is essential to regulate glucose in the body. Type 2 don’t make enough or don’t respond well to insulin, meaning they have poorer regulation of glucose. Eggs are versatile, nutritious, and filling. But they are the ultimate conundrum for diabetes researchers. The American Diabetes Association thinks they’re great, and recommends that people with diabetes eat them. Each egg contains around 0.5 grams of carbohydrates, which, in theory, keeps blood sugar in check. Eggs are rich in potassium, which is good for the heart by keeping sodium levels in check, and biotin, which is good for insulin production. They’re also low in calories and versatile to incorporate into a diet. Eggs contain 187mg of cholesterol, and official guidelines recommend that people with diabetes cap their daily cholesterol limit at 200mg. There is also evidence that heavy egg consumption raises the risk of developing diabetes for people who don’t have it. Eggs are also high in protein (about seven grams per egg), which, again, is controversial. Consume too much protein and the body turns it into glucose. In fact, even in this new study endorsing egg consumption, they found that some of the participants had certain biochemical compounds in their blood that increases their risk of the disease. The authors of the new study by the University of East Finland, published in the journal Molecular Nutrition and Food Research, say it’s still unclear. But, ultimately, it seems that, without overdoing it, eggs do offer some protective benefits in moderation. Their conclusion is one egg a day. 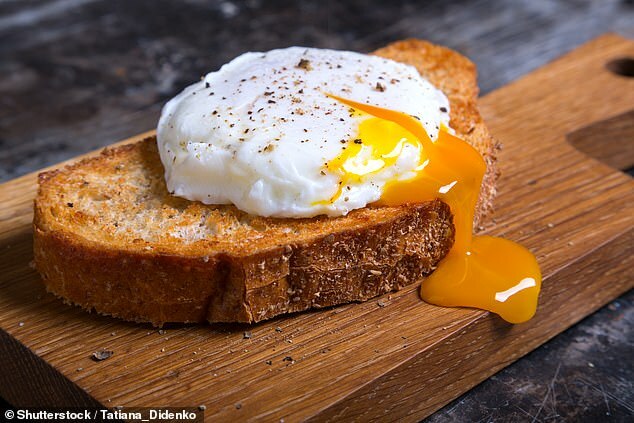 ‘Although it is too early to draw any causal conclusions, we now have some hints about certain egg-related compounds that may have a role in type 2 diabetes development,’ lead author of the study Stefania Noerman said. Current guidelines say three eggs a week is sufficiently healthy and won’t push you overboard. If you have diabetes, consider going for poached eggs to cut out other fats like oil or butter. If you’re set on a scramble, consider only using the whites, since most of an egg’s cholesterol is in the yolk.